What differentiates us from other hotel sites is that we only recommend the best places to stay in New Orleans; hotels that we have personally visited and would recommend to our friends and family. If we don't like it, then we don't list it. Period. The hotels you'll find on our site range from upscale and modern to classic bed-and-breakfast style. Each has its own personality, which we have tried to capture in every listing. So whether you're looking for a place to stay for a romantic weekend getaway, a family vacation or a bachelorette party, you'll be able to find it here. Best New Orleans Hotels is not a third-party reservations service. When you check for available New Orleans hotels, all reservations are booked directly with the hotel so that you get the lowest rates and the best customer service service. When you click "book now," you will complete your reservation directly on the hotel's website. 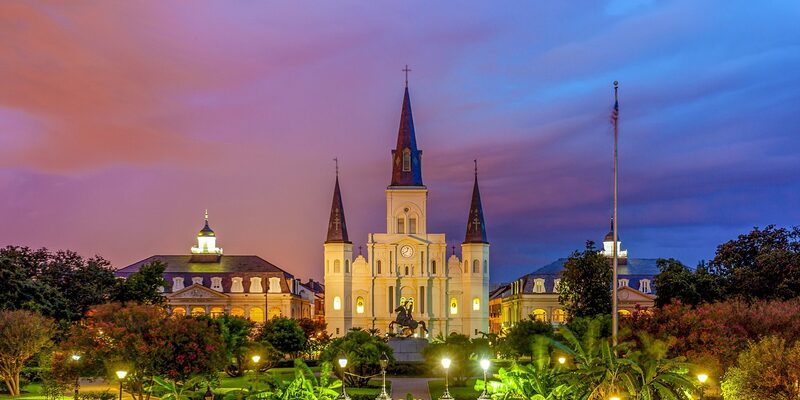 Take a stroll around Jackson Square, stopping to admire the local artists and street performers as well as gaze at the St. Louis Cathedral. Enjoy traditional New Orleans jazz while you explore the Mighty Mississippi aboard the Steamboat Natchez. Take a trip to the historic National WWII Museum where you can try on vintage helmets and other equipment from the war. Whether you want to be in the center of the excitement or enjoy a relaxing weekend, we’re here to help you choose the location that’s right for you. You’ll be in walking distance of major attractions when you stay in the French Quarter, where the excitement starts just steps from your hotel. Relax with large oak trees and gorgeous antebellum mansions surrounding you in the historic Garden District. You’re also just a short streetcar ride away from the French Quarter. New Orleans cuisine is heaven, but with so many choices choosing the perfect places to dine can be overwhelming. Whether you want a magical moment with fine dining or something a little more casual, we can help. Antoine's- A tradition of award-winning Creole cuisine set in French Quarter ambiance. Court Of Two Sisters- Legendary Jazz Brunch and picturesque courtyard. Tujague's- The second oldest restaurant in New Orleans. Check out NewOrleansRestaurants.com guide by location to see our favorite places to eat close to you! New Orleans, a city known as the birthplace of jazz, comes alive with the stars come out. We know how to have fun and celebrate any occasion and our love affair with music is second to none. The Big Easy is the perfect place to bring your family. For a full list of kid-friendly favorites, check out NewOrleansKids.com for many kid-friendly attractions and exciting tours, as well as free activities. We’re excited to share our beautiful and fun city with you! There are so many fun things to do and see around town. As locals, we know all of the latest hotspots and can’t miss events. Here’s a list of things to get you started. If you have any questions or need additional recommendations, let us know!